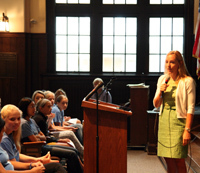 Olympic swimmer Diana Munz visits HB students! Students in Hathaway Brown's Primary and Middle schools had a special treat this morning when world-class swimmer (and HB mom!) 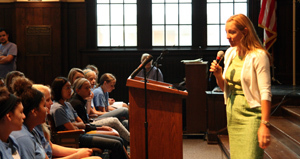 Diana Munz shared some inspirational words with them during their morning assemblies. Munz holds three Olympic medals. In 2000 in Sydney, Australia, she earned a gold medal in the 4x200-meter freestyle relay, and a silver in the 400-meter freestyle. Four years later, in Athens, Greece, she won a bronze in the 800-meter freestyle. 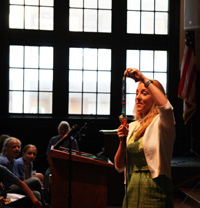 She brought her medals along with her today, and displayed them for the students. Some of the girls even got a chance to touch them. Munz began her swimming career at the age of 7 as a member of the local Lake Erie Silver Dolphins Swim Team. By the time she was 13, she had competed in the Olympic trials. She made the United States Olympic team during her senior year at Chagrin Falls High School, less than a year after she was in a serious car accident in which she broke her back. At this morning's assemblies, Munz encouraged the students to always try their best, and persevere through life's obstacles. "If you believe you can do it, then you can do it," she advised. While she was growing up, she said it was difficult for her to manage the demands of twice-daily swimming practice, school work, and friends. But in the end, all that hard work proved to be worth it. Members of the Blazer Varsity Swim team also had the opportunity to spend time with Munz while she was on campus. Now a television sports analyst and public relations specialist, Munz serves as the associate director of swimming and special projects at SPIRE Institute in Geneva, Ohio. She also is the mother of two young girls, one of whom is a preschooler at HB. Today's visit was organized by the Hathaway Brown Parent Association.